1. 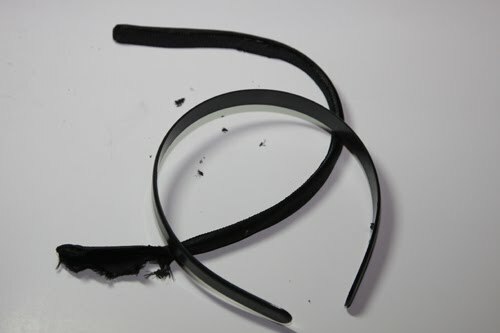 If your headband is covered in fabric, cut it off and remove the plastic center. 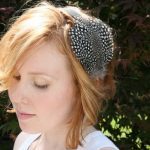 Cut a piece of fabric exactly 2x the width of your headband, and the length of your headband +1″. 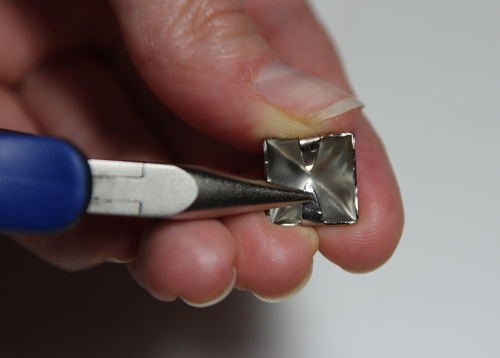 Use pliers to bend the prongs of the pyramid studs underneath and out of the way. (Optional) Spray paint your spikes and studs bronze and allow to dry. 2. 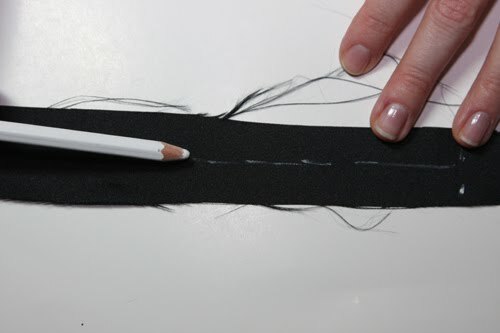 Mark the center of your fabric lengthwise. 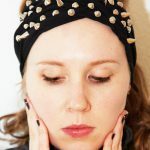 Try on your headband and make a mark above your ear where you want to start studding. 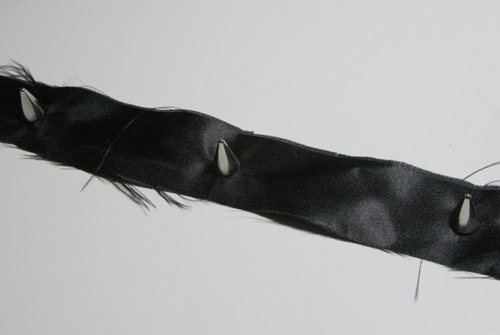 Match up the fabric (with a 1/2″ underlap to the headband), and transfer the mark to your fabric. Transfer the mark to the other side of the fabric as well. 3. 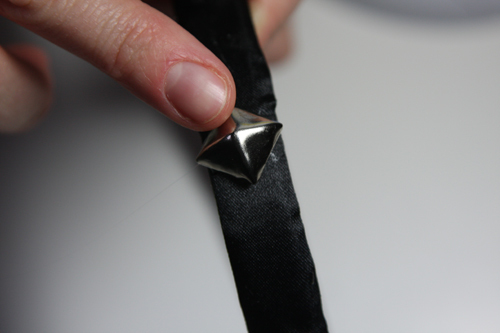 Lay your fabric out and place your studs on it to determine placement. 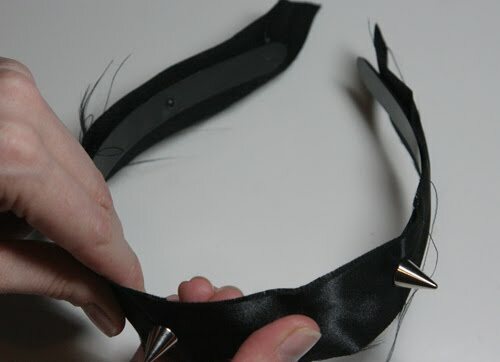 The cone spikes will have to be set in the fabric itself, so mark where you want them to go. 4. 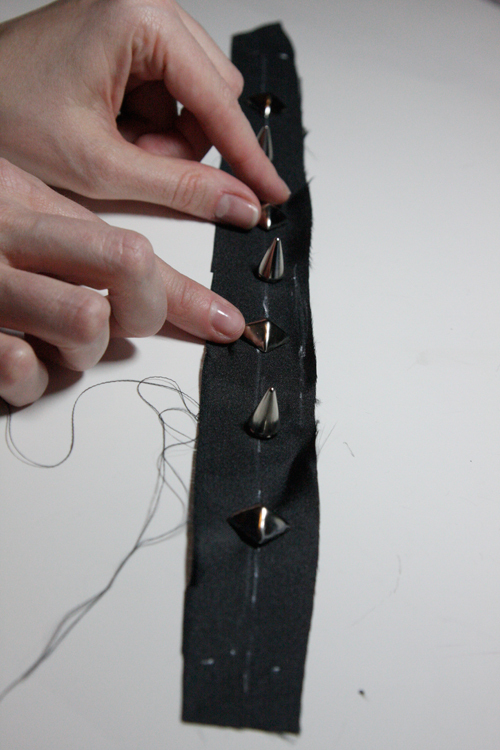 Make holes for all your cone spikes, and set them in the fabric. 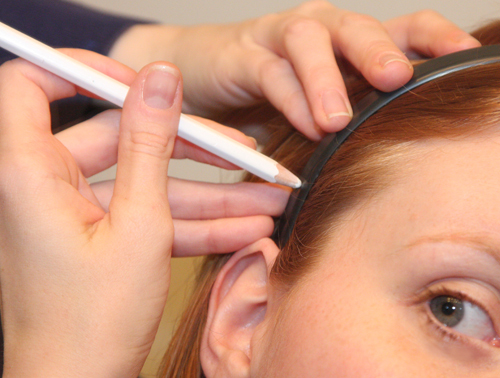 Tighten with a screwdriver. 5. 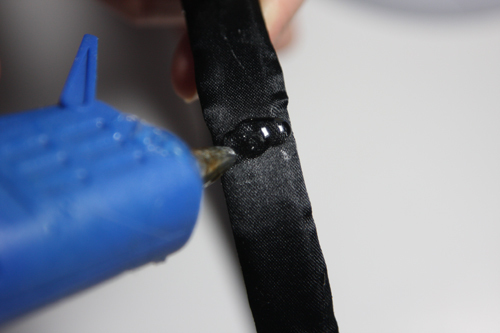 Use Loctite Vinyl, Fabric, and Plastic Glue to glue the fabric onto the headband. 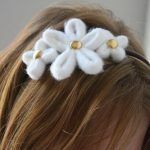 Make sure the headband is centered on the fabric. 6. 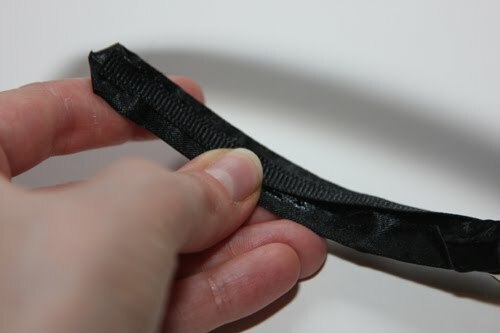 Once the glue is dry, fold both sides of the fabric around the headband, to roughly meet in the center on the underside. It doesn’t have to be exact. 7. 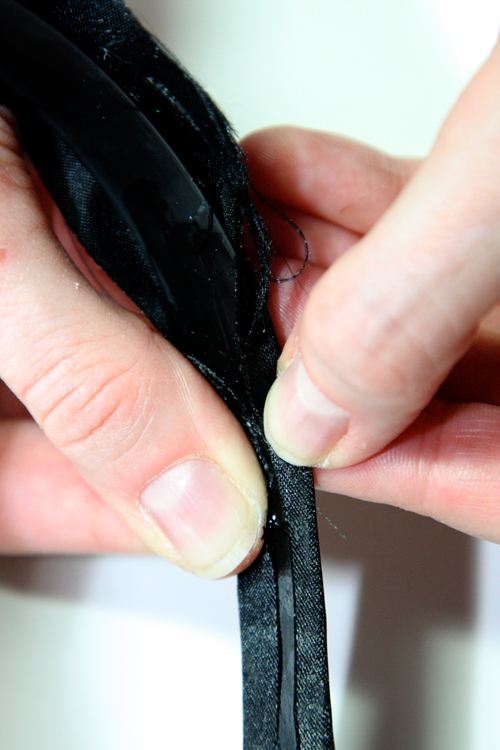 Fold the ends of the fabric to the underside of the headband and glue down. 8. 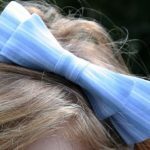 Glue a piece of grosgrain ribbon to the underside of the headband to cover the raw edges of the fabric. 9. 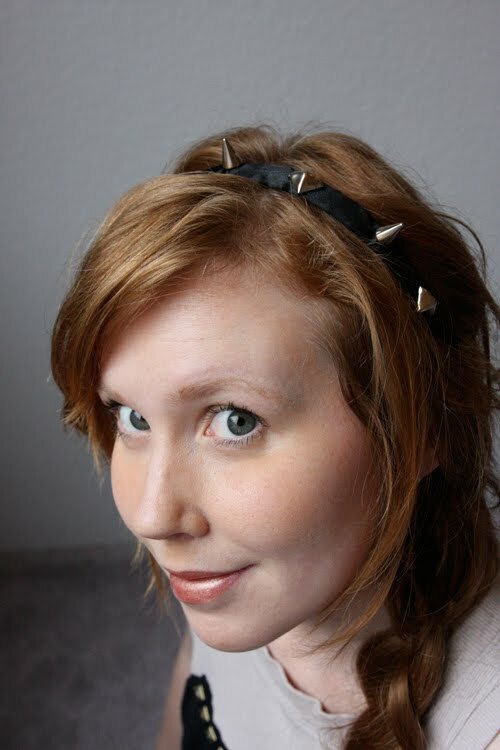 Use a mound of hot glue to secure the pyramid studs onto the headband, in-between the cone spikes. Allow to cool. Voila! 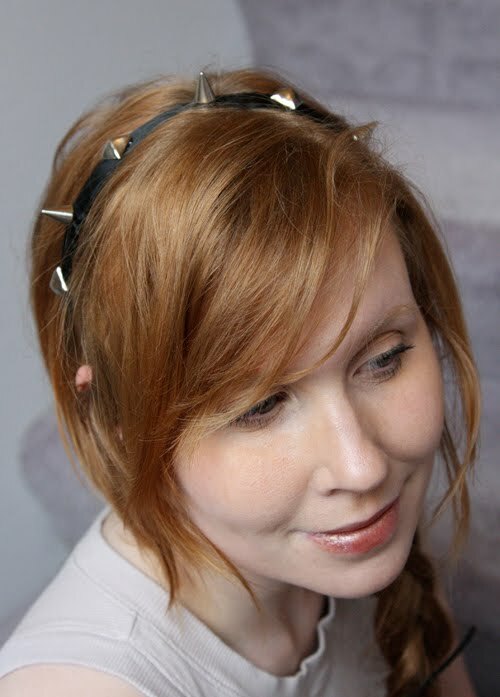 A hard-edged, slightly punky Crown of Thorns. $12 vs. $500??? I’ll take the $12 version any day! This is so awesome. Next, DIY those gloves with the chains! Please? Great tutorial! Thank you so much for sharing!!! Cool! I made a similar version, which you can see on etsy. For $20?? Why would anyone want to buy yours when they could make one for less? Good places to hit are goodwill or other y the pound versions. I hunt them down all the time for supplies. By the time I’m done I have more supplies than I can honestly support in my room. You should see the vastness of my DIY supplies from these places. 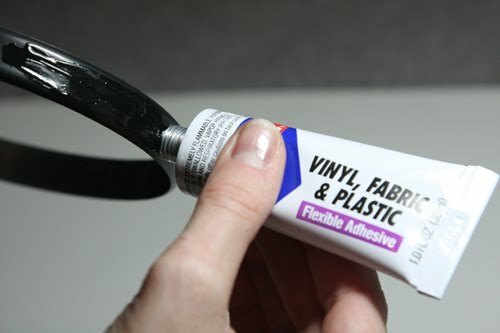 I could make this project under 25 cents, seriously DIY is the best and it always uses the three R’s, which I love the most. I also do t begrudge he selling, not everyone feels comfortable making stuff, or has the know how on it’s implimentations.